It’s the third day of my special week. A pumpkin quiche and a pumpkin soup were two things I already made. Besides that big orange thing he gave me, my girlfriend’s grandfather gave me also spinach, potatoes, parsley and shallots. 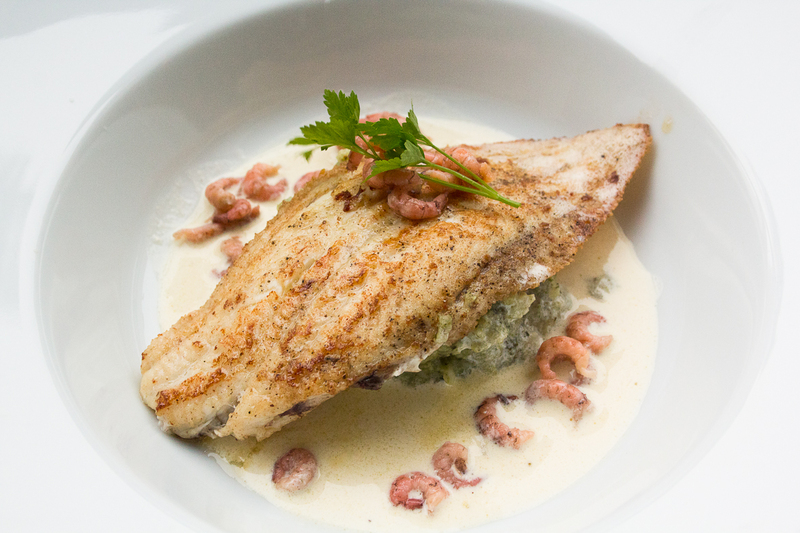 With those ingredients I made mashed potatoes with spinach, a sauce of white wine a crispy lemon sole. It’s an easy but tasteful dish, so here’s the recipe. What do you do? Start with the potatoes. Peel and boil them in salted water with the cumin seeds. When tender, pour the water away. Add milk, butter and the egg yolk. Mash everything. Season withpepper, salt and nutmeg. Stir spinach into a bit of warm water, and when slightly wilted (after about 1 minute), immediately add to potatoes. Keep warm. Chop the shallots for the sauce. Fry in a little bit of butter. Add the white wine and bring to the boil. When the wine is almost gone, add the fish stock. Cook until liquid is reduced by half. Add the cream and bring it again to the boil. Wait till the sauce start to thicken, turn to medium heat. Season to taste with pepper and salt. Add the shrimps, before serving. Sprinkle the flour on the fish. Season to taste with pepper and salt. Fry the fish in butter until crispy. Take a hot plate, place the potatoes in the middle. Place a fish on top of it. Finish with the sauce and a bit of parsley.